We need to remember that emotions can become trapped in the energetic field that makes up our body. They are energies of traumas, ancestral emotions, and our own emotions. Even ones thrown on us by friends, loved ones, and strangers. This happens through the course of our lives by listening to each others pain, when we are helping. Transferring of negative energies from one person to the next. Imagine the amount of energy that resides in us that is not our own. In our day to day we may not remember to cleanse and clear ourselves. Some of us may not even know where to begin. For 20 years Diana has been placing clients on broken glass as a therapy. The impressions left on the body from pressure can tell her where the emotions are. This is how she removes the memory from your emotional body, after you've learned your lessons. An approach to healing and an immediate feeling of relief in various aspects of your life. All you need is to overcome your fear of pain, and understand that this all exists within the mind. 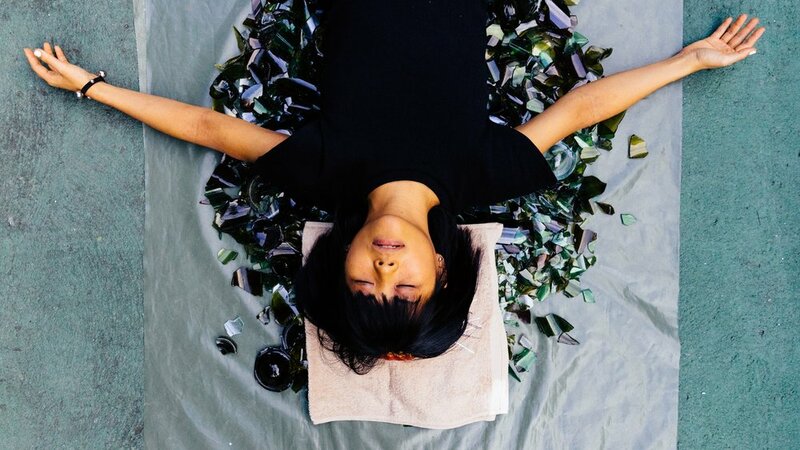 Similar to the way yogi’s would sleep on a bed of nails, broken glass therapy is a method to put you in a deep meditative state. This healing practice serves as a kind of acupressure. By stimulating the bodies ability to heal itself. Then removing energy blocks that interfere with your vital energy. When vital energy flows unobstructed, the body and mind function fluid. The removal can bring clarity that helps you face your fears and do things you didn’t imagine you could do. The broken glass empowering. Empowerment aside, this therapy is good for optimal health and clearing karma. Increasing blood flow, removing toxins, reducing stress, and serving as an aid for sleeping disorders. Clients have experienced an overwhelming sense of happiness, crying, even awoken feeling energized. At the next sign of broken glass, don’t run and lay down. Only do this with supervision of a shaman. The bed of glass is from wine and champagne bottles. Both of these sprits are made with grapes. Wine makers believe in a legend which tells them the juice of grapes are tears from the earth. The bottles are cleaned and heated in the oven at high temperatures to sterilize. After they are broken, all jagged edged pieces and shards are removed. The glass is blessed through shamanic ritual and ready for use. Diana then engages you with a mantra and you are ready to begin your journey. People don’t have enough experience to trust themselves. Walking on the broken glass gives you the experience to trust yourself. Then you can recharge your energy like a surge of adrenaline. Diana explains “People that have climbed Mt. Everest are afraid to walk on the glass. I was shocked! I asked, how? Why? They told me that they knew what Everest was, what to expect. Laying on the glass was unpredictable, a new experience. Or through their mind they knew the glass is sharp and may cut them, so they didn’t of how to protect themselves. See some client reflections or experience your own broken glass therapy by booking a session with Diana.